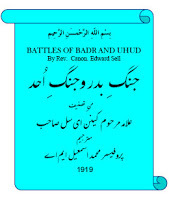 Battles of Badr and Uhud written By Father Rev Canon Edward Sell in 1919 and translated in to Urdu by Professor Muhammad Ismail M.A. This book contains history of Jang e Badar and Jang e Uhud in Urdu language. Battles of Badar and Uhud is now available here for reading and download. Visit the following links to read online or download the complete book in Pdf format to offline reading and references.